If you have an iPhone sitting around collecting dust and out of use, you may want to sell it, or perhaps even more rewarding, give to a friend or family member. Regardless of who it’s going to, if you’re transferring an iPhone to a new owner, there are a variety of steps you’ll want to take to prepare the iPhone for new ownership. Having been through this recently with an older iPhone that was sitting around in a drawer, I figured it was good to run through the steps again. This isn’t just for people selling an iPhone to someone else, it’s also great if you’re going to donate a device, or gift an iPhone (or iPad) to someone else and you just want to know the right steps to take in order to get it ready for the next owner. We’re going to cover getting your stuff off the device, cleaning it up, resetting it, taking out the SIM card, and more. You may still have some personal data on the iPhone, so you’ll want to get that off first. The best thing to do is just start a quick backup to a computer with iTunes, that way you’ll a backup file of the entire device if you decide it’s necessary (you can also extract photos from the iPhone backup if you ever need to). Next, get your photos off the iPhone by transferring them to a computer, whether to a Windows PC or Mac. Just be sure you get that stuff off the phone so that when you clear it off, you won’t miss anything. It’s good practice to update an iPhone’s system software before handing it off to a new owner. This is particularly true if the device has been sitting in a closet or drawer for a while and is on an outdated version. The iPhone 4S I just updated for new ownership was lagging behind on iOS 6.0.1 (!) and was updated to iOS 7.1.1, that’s a big jump with a lot of improvements. 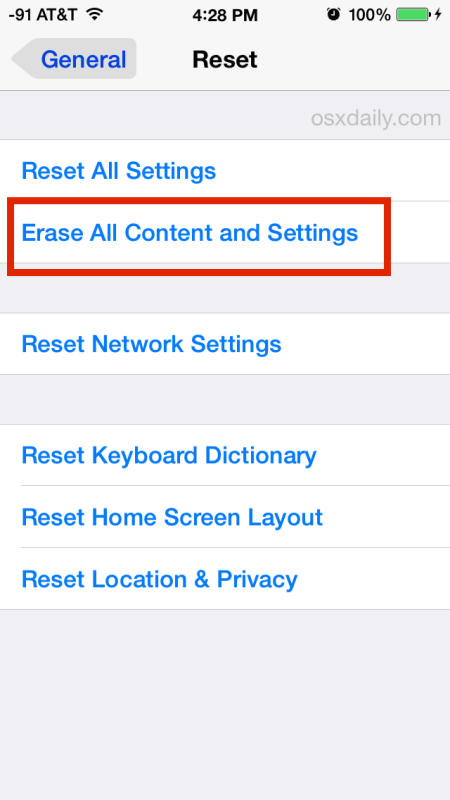 You’ll want to manually turn off the iMessage and iCloud services before whiping the phone, this is so that it will disassociate from the device. Failing to do this can potentially mean lost messages and general annoyances, so though it’s not entirely necessary, it’s good practice. The iPhone will soon reboot and be clear of everything… almost ready for the new owner! When the iPhone is done resetting to factory settings, it’ll reboot as if it was brand new – this is how you should give it to the new owner (unless you’re planning on pre-setting it up for them with apps, an Apple ID, etc, of course). Did you like to use your iPhone with greasy fingers while eating cheetos and dripping ice cream over the screen? Maybe your preferred iPhone reading spot was the bathroom? That’s great, but the new owner may not be so fond of a dirty iPhone that’s lathered in whatever residue is on there. So, do the courteous thing, and physically clean up the iPhone. The best way to do this is with a slightly damp lint-free cloth (don’t use too much water and don’t try to bathe the iPhone, too much liquid contact can cause damage). Turn the iPhone OFF (by holding down the power button and sliding to OFF), then disconnect the iPhone from any power sources (USB included), and just gently clean it with the cloth. Don’t get moisture into any of the openings, and don’t use any solvents or chemical cleaners on the iPhone, they can damage the surfaces. If you’re giving the iPhone to a family member, you probably won’t need to do this, since there’s little harm in keeping a family phone on the same support account. Got an iPhone that has a SIM card? Grab a paperclip, turn the iPhone onto it’s side, and pop it out, the new owner probably has no use for it. If the SIM card is still active, you’ll want to keep it around, otherwise, well, it’s a little piece of plastic, to the recycle bin you go. If the iPhone is locked with AT&T and the contract period is complete, you can request a free phone unlock from AT&T and it’ll often be done in under an hour. An iPhone on Verizon or Sprint that has a SIM card slot usually requires a phone call to the respective support channel, but they’ll typically unlock the phone too per request. The iPhone is Ready for New Ownership! That’s it! The iPhone has been backed up, data copied off, reset to factory settings, the gunky screen has been cleaned, the device has been disassociated from the Apple account, and the SIM card removed… and maybe even unlocked, it’s good to go to the new owner! 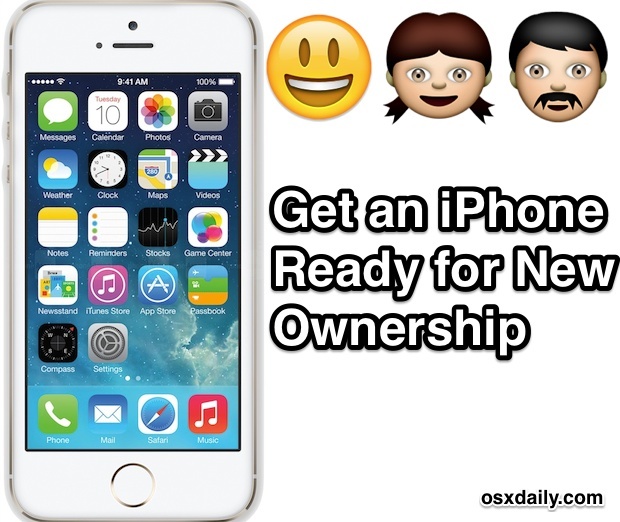 Do you have any special tips, tricks, or additional steps you take when preparing an iPhone for new ownership? Let us know in the comments! This is part of the reason that I enjoy the iPhone upgrade cycle; family members get the hand-me-downs! I find that’s usually a more worthwhile endeavor than selling the old model, though it will often pay for the upfront cost of a new iPhone. So hey iPhone 6, hurry up, this iPhone 5 has new owners already! Giving a used phone to someone as a gift is really crummy! Would you give your used underware to someone as a gift? Don’t be a cheapskate. If you are going to give someone a gift, make sure it is new. For many items, gifting new makes sense, but for tech like smartphones, computers, game consoles, TV’s? The prior generations are still great and very capable, so rather than collecting dust, why not let them re-use and giving away as hand-me-downs? I think it’s a good idea, and everyone I’ve gifted an old Mac or old iPhone to is always tremendously grateful, particularly if they couldn’t afford it on their own. If you have a prior gen iPhone laying around, try it out, give it to someone who could use it, you’ll feel good! There are a number of good of reason’s to hand-me-down, laptops, desktops, phones or whatever you find appropriate. It is often a good idea for younger children to have something to practice on and learn to use before spending big bucks and problems arise from mis-use. Gifting used electronics to adult’s maybe not so much. Only you know if it would be appropriate as all situations are somewhat different. Amen Cory! I like giving away my electronics because I’ve upgraded or simply because I’ve accumulated too many tablets, laptops, cellphones, tv’s and etc. The people that receive them are truly grateful because they never thought they could ever get something like that let alone afford it. I also like buying used and love hand me downs because who’s ever giving it to me didn’t have to think of me and I’m appreciative of receiving it. It’s much better to give than to receive…It’s truly a blessing to be a blessing! I have to say, my kids have enjoyed having one model back from the newest iPhone for years. ‘Leafy’ obviously has more money than most of us and the underwear analogy makes no sense. I bet his real name is Richard! *** Do not forget to TURN OFF “Find My Phone” before anythingelse. Great point, that is a must-do! All I can say is if someone gifted me a used “anything” I would immediately smash it on the nearest wall, right in front of them and tell them to take a hike. Stick that in your pipe and smoke it ‘Hairy’. You are a spoiled brat! OMGosh! Leafy… you are so rude. I feel sorry for a person as sad as you are. Seriously Leafsley, WTF? Not asking if you are married but if you are is she your first wife or a hand me down? Did you smash her head right in front of them and tell them to take a hike? LOL… you are either richer than I am and really feel that way or you are dirt poor…..
Do not upgrade to the latest iOS. Let the user that receives the device choose whether they want to upgrade or not. This made the process of giving the phone over to my youngest so a breeze! Wow a really big thanks it was so easy and perfectly written. What if you are buying from craiglist? Can you recommend procedures to ensure the phone transfer is good – not blacklisted, not icloud lock, etc? I want to let my child use the iphone for school apps, texting grandma and listening to pandora. I bought a whole bunch of learning apps on my account. if i wipe it do i have to rebuy them for her to use them? in which case should i just keep the phone. Leafy gifting is a sign of caring for another person. If you received a used iPhone it’s clearly because you don’t have or couldn’t afford that model. But it’s obvious no one had cared to give to you, nor should they. So before you insult someone giving realize how obvious you’re making it saying that no ones given you anything. People like you, ungrateful…… Disgusting bottom feeding filthy animals. I’m confused about the SIM card. I have a 5. It DOES have a SIM card. I Erased all contents and settings as per instructions. Isn’t that enuf in order to hand it over? Is any of my data on the SIM card? What exactly is a SIM cards function? Thank you. The SIM is the ID number for your phone number – if you got a new phone and a new SIM (and transferred the number to the new SIM), the old card is useless. If it is an active phone number, and you are transferring that as well, leave the SIM in. If you are not transferring the phone number, don’t leave it in, as someone else will be using your phone number/data/etc. Remove the SIM card before transferring the phone to a new owner, as it is associated with your cell phone account, may have personal information on it, and it’s likely that the new owner won’t be able to use it on a different account or different carrier. There is a unique serial number for each SIM card, which the cell phone company uses to associate the SIM card (and any phone that the SIM Card is plugged into) with your cell phone account. If you give away a phone with your SIM card in it, you must first tell your cell provider to remove that SIM Card from your account. The new owner of your phone could then call the cell phone company and set up a new account using that SIM card, or associate that SIM card with an existing account. Unfortunately, cell phone companies usually will not let you re-use a SIM card from another account, will not let you use a SIM card from a different carrier, and will not let you re-use a SIM card that has not been active for a while. This is a policy issue, not a technical issue, since the SIM card serial number is globally unique. Some phones do save information directly to the SIM Card, such as contacts, so you would want to delete them before transferring the SIM Card to a new owner. If you have already used the SIM card in different phones, you may not be able to delete all of the personal information on the SIM card, due to operating system differences. If you save an older phone for a spare, you can just move the SIM card to your old phone, power it on, and immediately use it on your current cell phone account. I keep a couple of older phones charged and ready, so if I’m going to do some activity where the phone could get damaged or lost (bike ride, beach, vacation) I just switch my SIM card to the older phone and use it during that activity. Please i want a free iphone can someone give me an iphone? I will trade you an iPhone for a billion dollars, can you give me that? Found these instructions very easy to follow and would have been lost without them – thank you. As for the issue around hand-me-downs, my family members were queuing up! I just wanted to say that my BIL has handed me down several one-year old iPhones and I have been thrilled and deeply appreciative of each one! The company I worked for a year ago would not require us to turn in old phones when it was time for upgrades so as a result, I have an I Phone 5 in a drawer that has been there for about 2 years. I want to give it to my grandson. Can this be done? I have cleared my iPhone 6 and now wish to pass it on to my sister. She is not a techie. Can I set it up for her. I do know her email address and password. Thank you for reading this and hope there is a useful reply. My boyfriend upgraded to an IPhone 7 and gave me his 5se. I am thrilled with it. I have been a devoted Android user from the beginning and very Anti- IPhone. You know what? This hand-me-down is so much faster with the storage capacity for apps that I just can’t find in the $160 or less androids. The best part, its free! And since I also love the Tracfone Pay as you go plans, I simply got one of their sim cards for AT&T phones, inserted and connected to my account. Am grateful and most unspoiled people would love to get someone’s used Iphone because of the fact that they are too expensive new “i could never afford one and dont like leasing phones” and that it is so fast yet years old. I would have already tossed my android in trash by now…..
@paul.. as you said give those items to those people who are not capable to buy..it feels good , let me tell you m also one who is unable to buy iPhone x.. because I have no capacity to buy it…if anyone is interested to give old iPhone x then here is my Gmail.. contact me and please don’t hesitate to give…it will feel you good and me too..